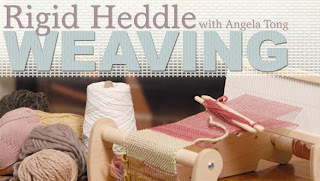 I had the opportunity to go out to dinner with Angela Tong last month while she was here in Denver filming her Rigid Heddle Weaving class for Craftsy. It was so fun to hear about how she got started weaving, and how she was able to share so many tips, tricks, and techniques with her students in her interactive class. Our daughter and I have been experimenting with weaving over the last year or so, and have had a lot of learning on the fly as we figured things out together. 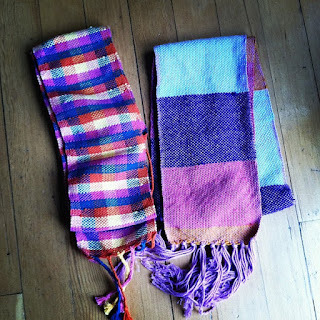 Laurel made these two beautiful scarves on her Cricket Loom, and I think they turned out wonderfully. *How much warp will we need? *How do we warp this loom? 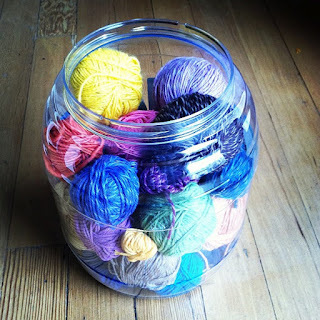 *What makes a good beginner's warp yarn? *How much tension should we allow for the selvedge? *What will variegated yarns look like on the warp? *Do we need paper to wrap the warp yarn? I wish we had access to Angela's class at this time last year, while we were learning all of these things by trial and error, with a little frustration along the way. I love that I can go back and watch Angela's instructions as often as I need, to remind myself of the details I may have forgotten. I also love that she has provided great worksheets for tracking my weaving projects, so I can learn more from each project that I make, and not forget and make the same mistake again! I go through crafting phases, and have been knitting and quilting a lot this winter. Weaving is in the air, and I am eager to put Angela's careful instructions into practice. Our daughter has been playing a lot with different weights of yarn, trying out various weaves and textures with this little potholder loom. I think my favorite thing about weaving is that it is a wonderful way to incorporate the bits and pieces of my favorite yarns into a new project. 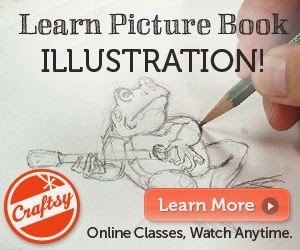 Angela has very kindly provided me with a link to an offer to take her class at Craftsy for half price. I would love to see what you are inspired to weave after taking her class! Sounds like such a nice class. 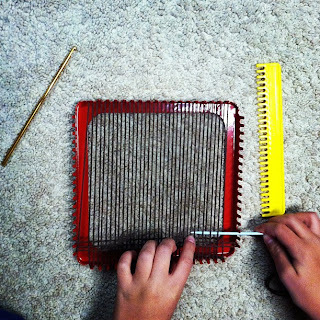 So fun that you can share this crafting experience with your daughter too. Thanks, Jill! I love knitting from books, but weaving from video instructions is so helpful! Our daughter is inspiring me to try all sorts of new fiber crafts! I've been seeing this class pop up everywhere, and I have a floor loom sitting in my loft all lonely - might have to dust it off!! 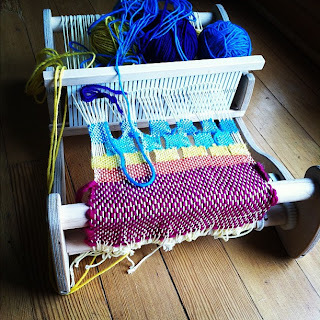 A floor loom sounds like a lot of fun~ let me know if you do have time to dust it off and start a new project!